If you’re constantly on your feet or regularly working out, then recovery is an important part of your routine. This is where a foot massager can come in handy, as it works to help relax and relieve sore arches and knots. Finding the best foot massager for yourself means reading reviews, studying product features, and diving into the ins and outs of available attachments and configurations. With the right foot massager, you can kick back and relax after a long, hard day. We reviewed dozens of foot massagers to identify the best of the best, based on Amazon reviews, how well they performed in operating tests, cost, and other considerations. We narrowed our search down to 5 of the top-rated foot massagers homeowners can purchase to help soothe their aching feet. Who Should Buy a Foot Massager? The Miko Shiatsu Foot Massager earned the top spot on our list thanks to its many settings and easy-to-use adjustments that help people find the best mode for their needs. It offers an optional heat setting for added comfort and relaxation, while the two independent foot chambers provide a soothing massage experience to all sides of the feet. While there are adjustment buttons on the unit itself, it also includes two wireless remotes for added convenience. Those who purchased and reviewed this foot massager commented on how good the massage was for the price, saying that it offered excellent value. Some reviews mentioned that even on the lowest setting this unit might be too intense for some people, something to keep in mind if you have sensitive feet. At a cost of $140, it doesn’t come cheap, but the quality craftsmanship associated with the brand, as well as the ease of setup and use more than justifies that price. It has a rating of 4.5 on Amazon with more than 1,000 people reviewing it, which we think goes a long way in convincing people to make the investment. The Sharper Image MSG-F110 Deep Kneading Shiatsu Foot Massager was our runner-up pick for the best foot massager in part due to its slightly lower review status than our top choice. That said, it still provides a pretty decent foot massage experience, and at a slightly lower price point. Those who prefer massage on all sides of their feet might find this unit cumbersome to operate. Users appreciated the deep-kneading shiatsu mechanism and six massaging heads that provide soothing relief for tired, aching feet. They also commented on the toe-touch controls, which took the hassle out of having to bend over in order to adjust the settings. Some reviews noted this machine could be a bit noisy while in use. With a price tag of $90, it’s not inexpensive, but the quality craftsmanship associated with the brand, as well as the ease of setup and use more than justifies that price. It has a rating of 4.0 on Amazon with nearly 400 people reviewing it, which we think goes a long way in convincing people that it’s worth the investment. The TheraFlow Large Dual Foot Massager Roller provides an effective relaxation option in an affordable and low-tech package. While it lacks many of the bells and whistles of the more expensive options on our list, it still provides an effective massage in order to help relieve foot pain and tension. The ridges have been spaced to press into trigger points on the feet, hitting all the right spots for pain relief. 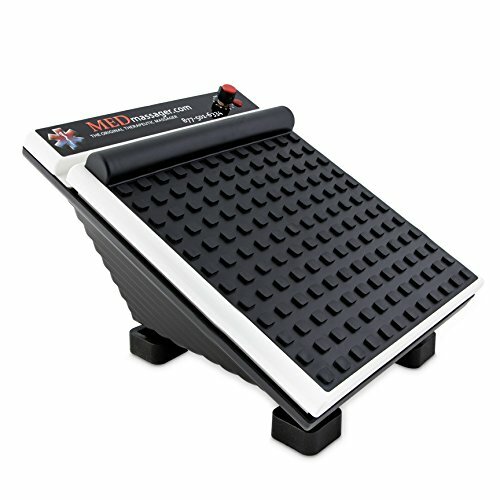 Those who’ve used and reviewed this foot massager appreciate the fact that it has anti-slip strips on the bottom, which help to prevent it from moving while in use. Several people commented that they were able to notice results in as little as one week of use. With an price tag of $17, this foot massager is a solid choice for those looking for a foot massager option on a budget. It has a rating of 4.7 on Amazon with more than 2,300 people reviewing it, which we think goes a long way in convincing people that this budget-friendly pick is just as good at treating their tender tootsies to some TLC as its more expensive counterparts. 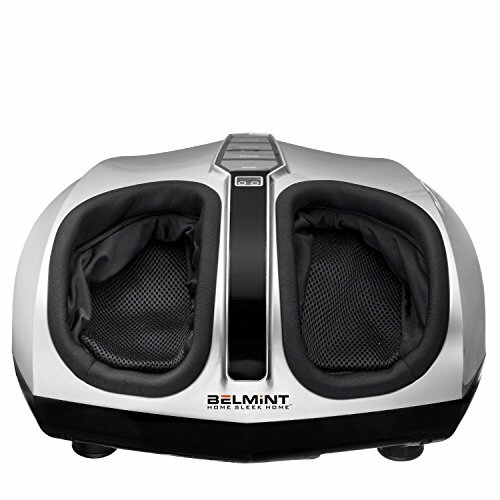 The Belmint Shiatsu Foot Massager offers superior foot massaging using deep-kneading massage techniques to provide relief for tired muscles and plantar fasciitis. It includes an easy-to-use toe control button so that you don’t have to bend over to adjust your setting. There’s also an optional heat setting for added relaxation. Those who purchased and reviewed this foot massager were impressed with the integrated shut-off timer, as well as the ability to adjust the pressure to their specific needs. Some reviews mentioned that the heel massager wasn’t very effective on this unit, and that they wished the heating element was a little stronger. When using the air pressure setting, some people found it pushed their feet out, but if you are firmly settled it shouldn’t be much of an issue. At a cost of $140, it doesn’t come cheap, but the quality craftsmanship associated with the brand, as well as the ease of setup and use more than justifies that price. It has a rating of 4.2 on Amazon with more than 1,600 people reviewing it, which we think goes a long way in convincing people that this shiatsu foot massager is worth the investment. The MedMassager MMF06 11 Speed Foot Massager hails itself as the most powerful electric massager available to the public, which is probably why it has such a high overall rating. It features a full-sized oscillating foot pad along with an arch-bar and a pressure point targeting surface which allows users to customize their foot massage experience to their needs. Health care professionals use this foot massager to help stimulate circulation in the feet and legs, highly recommending it for patients with diabetes and neuropathy. Those who purchased and reviewed this foot massager found that it helped tremendously with circulation issues. Although many people commented on how loud this unit was while in operation, most agreed that the trade-off in power was worth the sacrifice. At a cost of $240, it certainly doesn’t come cheap, but the quality build of the massager along with the ease of setup and raving reviews helps to justify that price. It has a rating of 4.4 on Amazon with nearly 600 people reviewing it, which we think goes a long way in convincing people to make the investment. A foot massager is an ideal choice for those who spend a lot of time on their feet. The bones in the foot and the toes can get sore and uncomfortable after a long day spent standing, and a foot massager can help to work out any knots or sore spots. A good quality foot massage can help to relieve pain and improve circulation, as well as relax your entire body. While going for regular visits to a spa for a professional foot massage can be costly and time consuming, having a foot massaging machine at home can help save time and money, while helping you to relax from the comfort of home. A foot massager can also be beneficial to those with medical conditions like plantar fasciitis or neuropathy, and those with poor circulation. Style. The first thing to determine when shopping for a foot massager is which style will best suit your needs. There are three main types of foot massagers, including electric foot massagers, manual foot massagers, and foot spas. Electric foot massagers use a motor in order to move components in order to massage the feet, whereas a manual foot massager uses a rolling action in order to target the soft tissues of the feet. Because the user can manipulate the massager, it allows them to localize the massage or concentrate it on certain areas of the feet. Finally, foot spas are another type of electric foot massager that uses a combination of water and heat to provide therapeutic action. Cushion surface. Some models of foot massagers offer a cushioned surface for the area where you place your feet, which provides comfort to the contours of your feet during use. Speed. A choice of speeds, allow you to customize your massage experience. Control options. On most foot massagers, the machine’s controls are located on the body of the device. This means you’ll need to bend down to make any adjustments. Some of the higher-end and sophisticated foot massagers include a remote control for ease of use. Heat. The option to include heat with your foot massage is another feature to keep in mind when shopping for a foot massager. Heat helps increases the therapeutic benefits of the massage while helping to relieve foot pain. Price point. Finally, consider how much you are willing to spend on a foot massager. Foot massagers vary in price from $10-$300 or more. You can sometimes find discounts or coupons from merchants that can make buying a foot massager more affordable. What is a foot massager and how does it work? A foot massager is an electric or manual device that is used to massage the soft tissues of the foot in order to provide relaxation and other health benefits. It works by moving nodes in various patterns in order to “massage” the feet. Are electric foot massagers safe? Electric foot massagers are generally considered to be safe when used according to the manufacturer’s instructions. If you have skin eruptions or inflamed or swollen areas on your feet, or difficulty using the machine’s controls, then a foot massager might not be right for you. If you feel any discomfort while using a foot massager, stop using it immediately and speak with your healthcare provider. If you’re concerned about whether or not an electric foot massager is safe for your specific situation, always speak with your doctor to determine a treatment plan. Pregnant women should also consult with their healthcare provider before using a foot massage machine as there is a trigger point on the foot which can trigger preterm labor. Why does it feel so good to get a foot massage? It feels so good to get a foot massage for a couple of reasons. First, just like anywhere else on the body, soothing touch has a very relaxing and healing effect when applied to the feet. Second, there are various pressure points on the foot which correspond to parts of the body — so when they are massaged, it can help relax the entire body. According to Chinese medicine, there are also several meridians which begin in the feet and flow up the body, and it is believed that a foot massage helps to stimulate and balance energy in the meridians and corresponding organs. What are the health benefits of a foot massage? The health benefits of a foot massage are many and have been used by various peoples throughout the world for hundreds of years. Some of the health benefits of a foot massage include improved circulation, stress relief, energy rejuvenation, and lessened muscle stiffness or pain within the muscles of the feet. We looked at 20 other foot massagers. Even though they didn’t make our 5 best foot massagers list, they’re the best of the rest and each is still a great option for soothing tired soles. The information you’ll need to compare each one is included with the listing. This foot massager includes six massage heads with 18 rotating massager nodes to help relax sore muscles and ease tensions. Choose from four different pre-programmed massage styles in order to get the most relaxing experience for your tired tootsies. 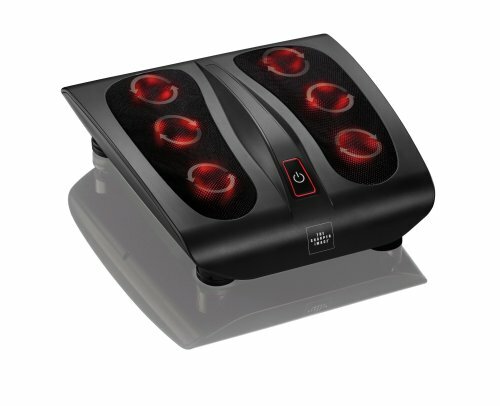 This foot massager comes complete with 18 rotating massage heads and a choice of two intensity levels to help relieve stress and tension in the feet. This foot massager offers a safe and effective way to experience electric muscle stimulation in order to help boost circulation, relieve stiff muscles, and reduce swollen feet. This massager provides users with a relaxing shiatsu-style massage from the comfort of home, and offers a choice of massage directions and an optional heat setting for added relaxation. This foot massager comes complete with 3D vibration technology with a controllable heat function so you can control the precise level of intensity you need. This foot spa’s invigorating water jets and built-in heat provide a soothing and relaxing massage experience for tired tootsies. Suitable for daily use, this foot spa quickly heats the water and maintains temperature for an at-home spa experience. It boasts a safe and secure double overheating protection for added peace of mind. This foot spa offers a soothing and relaxing retreat for tired and achy feet and includes four powerful water jets designed to target tight muscles while boosting circulation. This soothing foot spa uses a combination of massage, bubbles, and smart heat to create a relaxing spa oasis right from the comfort of home. This unit offers a soothing and relaxing massage experience for both calves and legs and offers a choice of two modes and three intensities. Once fully charged, this leg and foot massager system provides up to two hours of operation and includes an easy-to-use remote for added convenience. This foot and calf massager boasts a unique figure eight design that completely surrounds the feet and calves to provide a fluid, highly effective massage experience. This massage system is suitable for use on arms, legs, and feet, and offers a choice of three massage intensity levels and two massage modes for superior relaxation. Offering coverage from the knees to the toes, this leg and foot massager boasts a lightweight design and easy-to-use velcro closure system to get just the right fit. 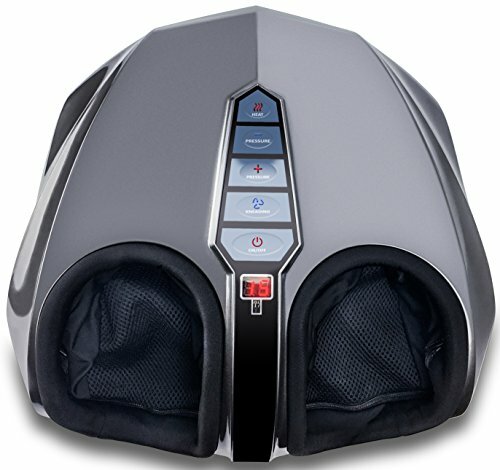 This foot and calf massager offers a shiatsu-style massage which uses kneading, vibration, rolling, and heating techniques in order to soothe sore and tired feet. This foot massager uses circular kneading shiatsu massage up and down the length of the feet in order to rejuvenate tired arches and soles. This foot massager works to effectively relax tired and sore feet after a long day, and boasts a selection of three adjustable massage strengths and integrated timer system. This foot massager offers a choice of three intensity levels and three different modes to provide a fully customizable foot massage experience from the comfort of home. Offering a choice of two speeds, two heat levels, and two automatic modes, this foot massager presses the foot from above and below to create a soothing and relaxing experience.